Summertime is in full swing. For many, that means that outdoor entertaining is at its height for the year, which usually includes cooking out on a grill. But improper use or inattention when firing up the barbecue can lead to property damage and hazards. From 2011 to 2015, the National Fire Protection Association reports that outdoor grilling was the cause of more than 9,000 fires per year. Nearly half of all grill fires caused damage to primary dwellings. 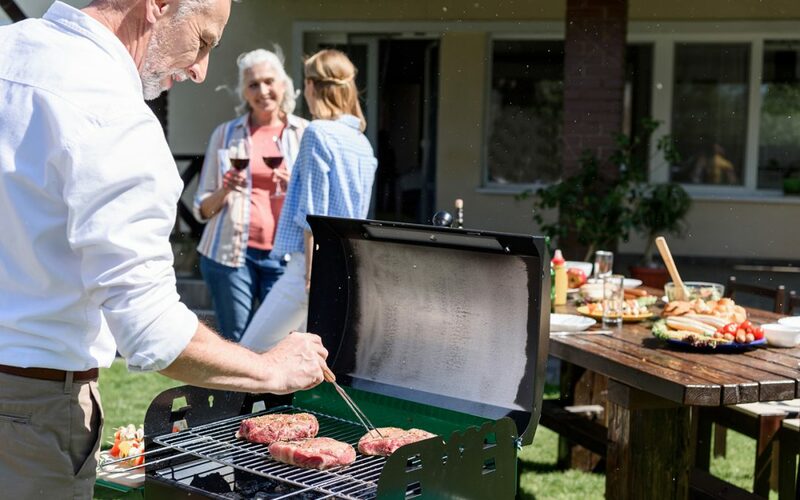 In order to help everyone make the most of their outdoor parties while also keeping the fire where it belongs, here’s a list of the top five grill safety tips. Whether you’re using a propane grill or prefer the traditional charcoal method, a clean grill is essential for safety. For gas grills, this means scrubbing the grate and removing any charred material and grease from both the burner area and the drip trays. Also, make sure that gas lines and all components of your grill are in perfect shape prior to firing up the grill. For charcoal models, scrub the grate with a wire brush to remove buildup and soot. Just as with propane grills, you can apply a weak soap and water solution that will help you get a clean grilling surface. Spray the grate clean with the garden hose. You should also check to make sure there isn’t any ash or charred material lingering in the bottom of the grill or ash pan. Surprisingly, this is one of the grill safety tips that many people disregard. Grills should be situated ten or more feet from permanent structures during use. While it’s perfectly safe to stow a cool and unused grill under the protection of house eaves, it isn’t a good place for a hot and fiery one. Be sure that your grill isn’t positioned under any tree branches or near outdoor decorations when in use. The heat column isn’t always visible to the naked eye, but it can cause even living wood to burn with enough exposure. Deck decorations should be kept out of the grilling area since most are made of quick-burning artificial fibers. Experts advise that you keep both a spray bottle of clean, fresh water and a fire extinguisher nearby. The former allows you to spritz a sudden blaze that can occur if you’re grilling fatty meat and it won’t spoil the food. In the event of a larger fire, you should have access to a fire extinguisher and know how to operate it most effectively. This can prevent damage to property and personal injury, even if it does mean your main course is toast. In many instances of accidental fires, the grill was left unattended while still hot and active. You may be tempted to wander off while your burgers are cooking because the party is happening elsewhere. Resist your temptation to do this. You can get the whole group to help the designated grill chef by organizing activities and conversation areas nearby and enlisting ingredient runners. Have your kids or friends take an active role in grill safety by bringing tools and food to the grilling area. This may require a bit of logistical planning ahead of time, especially if you’re throwing a block party this summer. Overloading the grill surface, especially with meat items, can provide an excess of fatty drippings. These feed fire better than many other fuels and can cause a major blaze, which will result in charred dinner at best or fire-extinguisher chemicals on your food. No one should eat that. Grilling is one of the most fun ways to celebrate summer with friends and family, but it should be done safely. Make sure that everyone has a good time when visiting your home for a cookout by following these simple grill safety tips. JS Consulting Group serves Southern California with property inspection and consulting services, including ADA and Reg 4 Fire Inspections. Contact us to schedule any of our services.